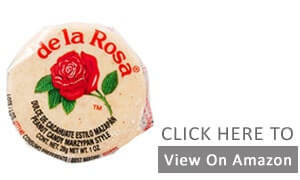 Da Le Rosa Marzipan Peanut Candy is a delicious mouth melting peanut candy and is loved by most of the people who tried it. This candy is really sweet and gives a sweet fruity smell. The peach color of the candy makes us think of its creaminess. The candy is in a texture which melts as soon as we take it into the mouth. There are layers and layers of Marzipan peanut in the candy. The peanuts are not powdered and are found in chunks which make it crispy in taste. This Mexican candy is basically the mixture of sugar, honey, roasted peanuts and some other ingredients. The coarse peanuts which are not totally powdered with the other ingredients of the candy, add to its amazing taste. People with any kind of nut allergy should avoid this for the obvious reasons. Also, people with diabetes can also skip it because it is too sweet and not good for their sugar levels. Rest everyone, especially small kids will enjoy this. Be careful while opening the packet as this candy tends to crumble a lot! The packaging is just like a small toffee. It is easy to carry in your pockets and small containers. 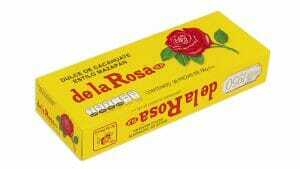 There are times when we do not want to have something as sweet as chocolate or as crispy as biscuits, there comes the role of Da Le Rosa Peanut Candy. This crispy sweet candy wins the heart whenever taken inside the mouth. So, what are you waiting for? Go and grab this candy by clicking here before it’s too late.